Just ate some cottage cheese with a plastic fork. It was good, but it wasn't toasted to perfection. I usually refuse to eat food that isn't toasted to perfection. Occasionally I will eat food that is grilled to perfection, or perhaps roasted to perfection, but that is another matter. What I seek in a cottage cheese is consistency and probity. It matters not the size of the curd. This reminds me of the time when I was eight years old, scanning the ground around the pool concession stand for dimes. If I could find a dime I could buy some Sixlets. Did I find a dime? Hell no I didn't, which is exactly my point. I only toast things to perfection when I'm expecting company. Otherwise it's too much trouble, and leads to unmanageable expectations on the part of my family, leeches that they are. For a real challenge, toast ham. It's easy to get into the toaster, but just try prising it out again! Now that's a true test of mastery, Grasshopper. What about broasted to perfection? Do people broast anymore? The Byerly's in Bloomington, MN, used to have a cafe that served broasted chicken. Sadly, that Byerly's has gone, along with the idea of having cafes in supermarkets. 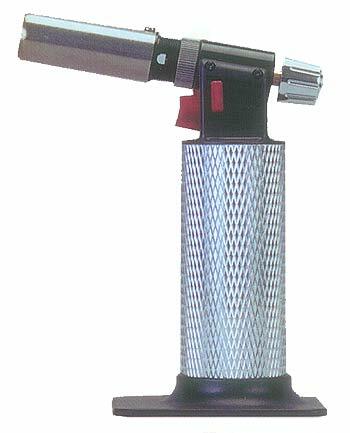 What you need is one of these culinary torches, like a little flamethrower, which are used to bruler creme brulee. Toasted Sixlets are no good, so it's just as well you didn't strike it rich. Have you tried toasted broccoli? What the heck is a Sixlet? sixlets! THAT IS WHAT I WANT FOR BREAKFAST RIGHT THIS VERY SECOND. Miss Wilberforce-Packard, what has tha foul Cottage Cheese done to you?